Unwind after a stressful day with a soothing cup of this raspberry, chamomile and mint tea. Wonderfully soothing for a headache, upset stomach, or heading off a cold. 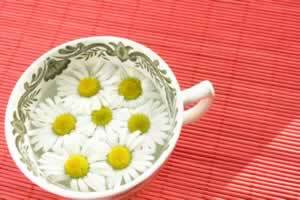 Recipe Instructions: Herbal Tea :Use 1 teaspoon of dried herbs to each cup of hot water. Infuse in a covered container for 10 minutes. Delicous hot or cold, but hot is best for cold tea.